If you have built the Monkeyprint DLP printer control board you might now ask yourself how to hook it up. Follow this guide and in no time you’ll have your board up and running…. We’ll dive right into it, so get your soldering iron ready and prepare your tools. Caution: take care not to electrocute yourself while fiddling with the mains voltage! Properly insulate all high voltage lines! 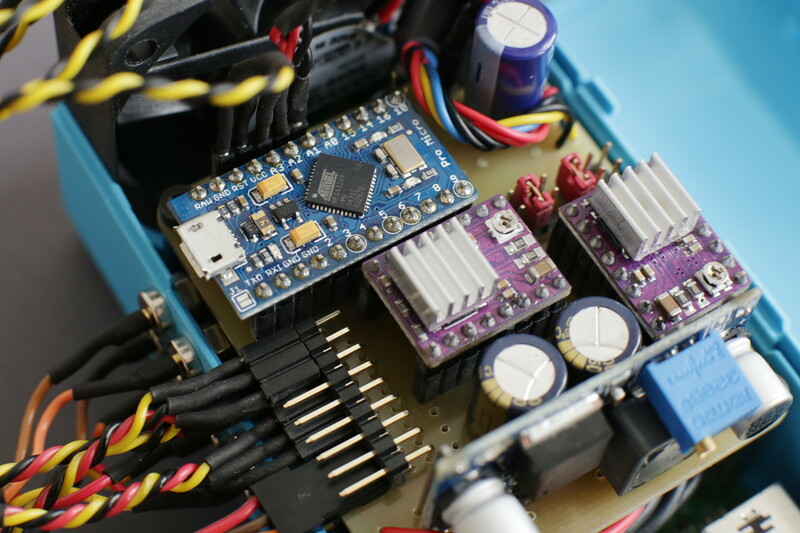 You can supply the board with a voltage of up to 36 V. The higher the better your steppers will run. I use a Meanwell RSP-200-36 with 36 V at 5.5 A maximum current which costs about 50 €. The Meanwell RSP-200-36. I use a mains connector with integrated fuse and switch. 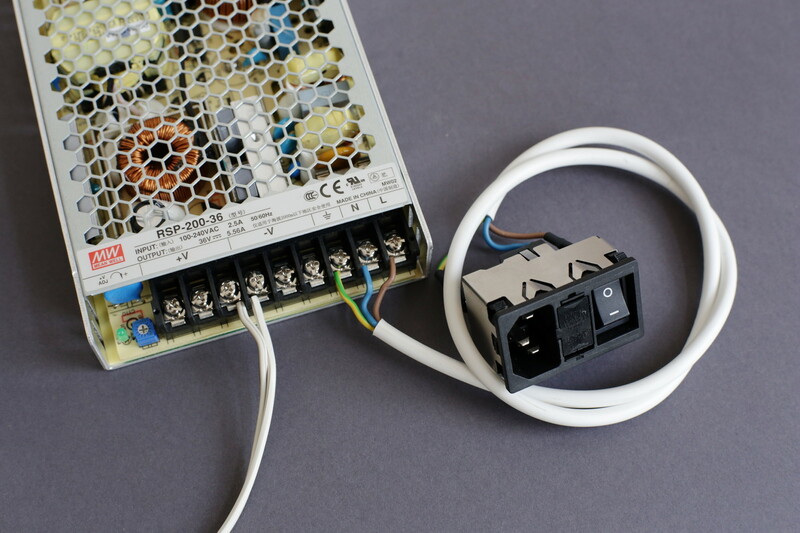 The following pictures show how to connect the power supply. To be able to unplug it I use 2 mm gold plated banana plugs. Pay attention to the polarity, there is a “+” and a “-” sign at the bottom side of the board. The power lines are connected to 2 mm female banana plugs which I simply screwed into my electronics box. Now before you switch on the power supply for the first time, remove the Arduino and the stepper drivers from your Monkeyprint DLP printer control board! We need to set the step down module to 5 V first. The next two pictures explain how it’s done. With this step your power supply is set up. Let’s continue with the stepper motors. 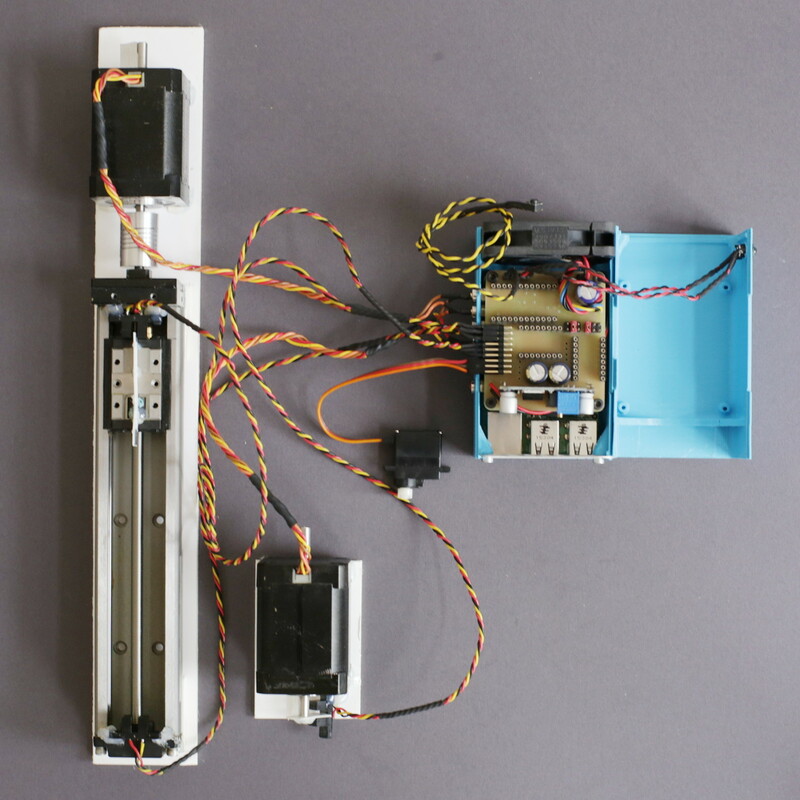 There are four power lines for each stepper motor, two for each winding. 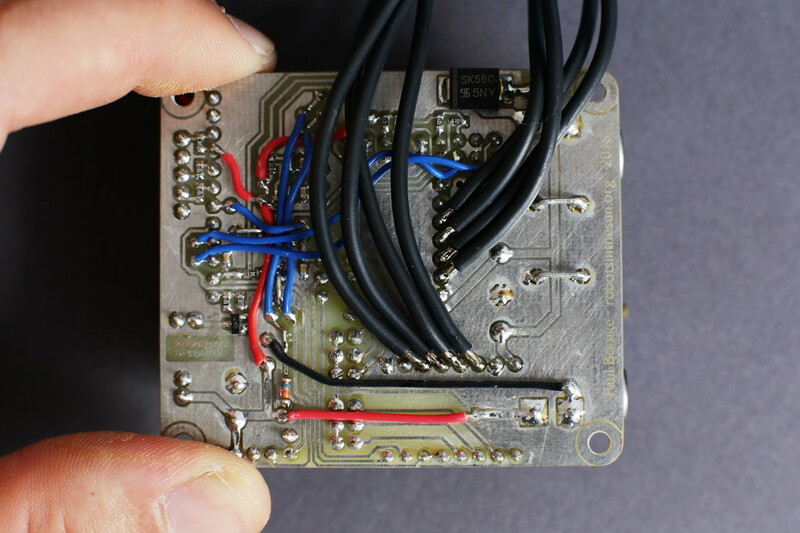 The cables can be soldered directly to the board. 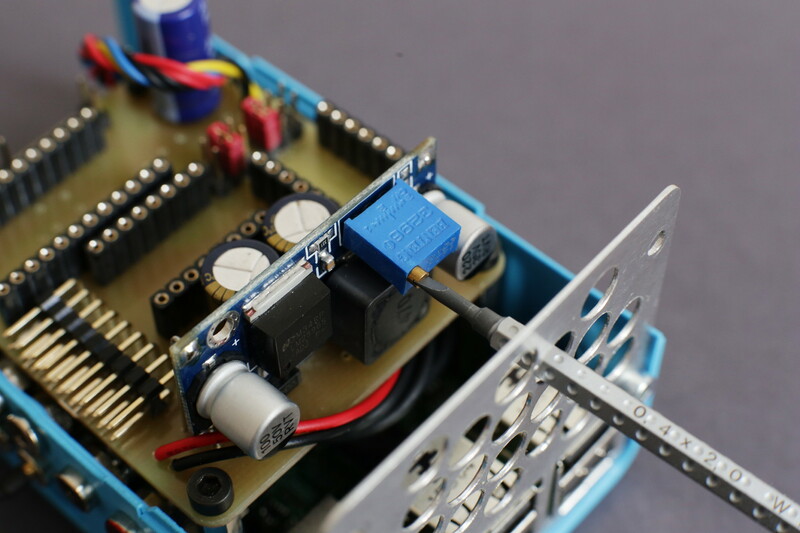 I use some 2 mm female banana connectors in combination with my 3D printed electronics box so I can easily unplug the motors. 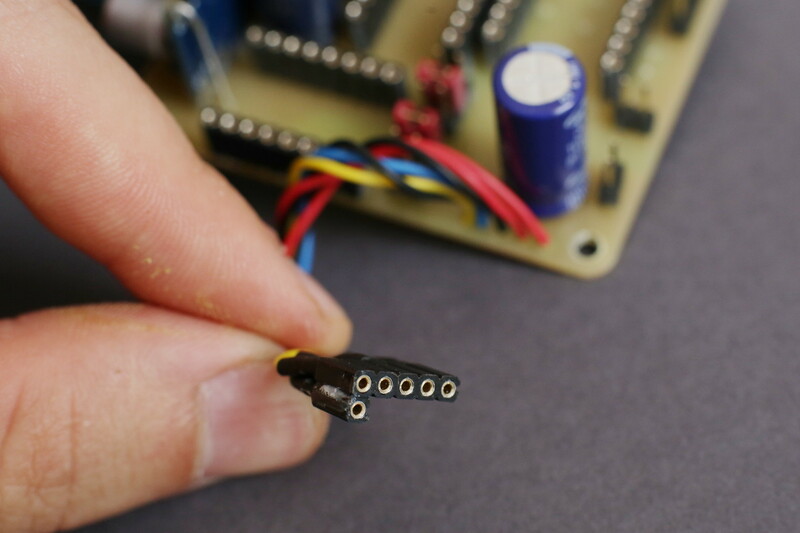 … and attach some connectors to the ends. If you mount the connectors like in the picture, make sure you mount them in the same order as they are on the board. 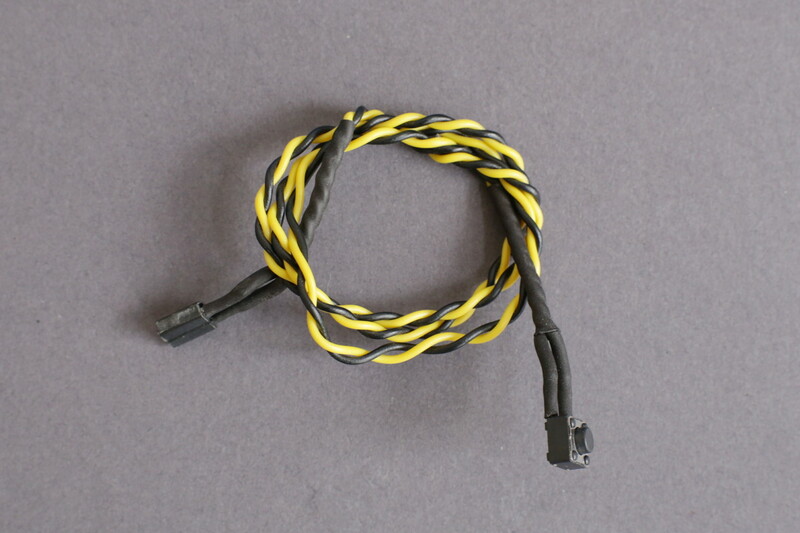 Before you plug in your motors you need to find out which two cables belong to the same winding. If you don’t have the motor’s data sheet, simply put your multimeter to resistance mode somewhere in a range between .1 and 20 ohms. Lines that belong to the same winding will show a resistance value while lines that don’t belong together will show infinite resistance. The order of lines on the board is A1 A2 B1 B2 where A and B are the windings and 1 and 2 are the two lines of the same winding. 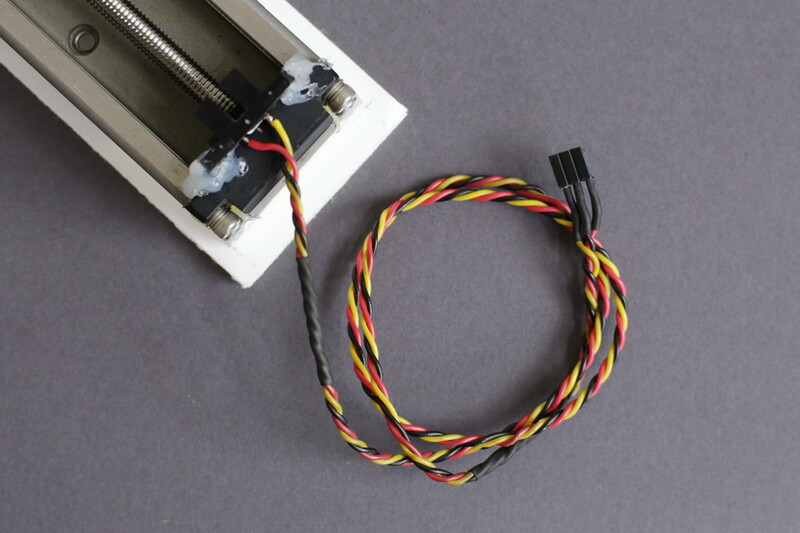 Once you found out your stepper motors color coding for the windings, plug it into the connectors. The order of the connectors is A1 A2 B1 B2 where A and B are the windings and 1 and 2 are the two poles of each winding. 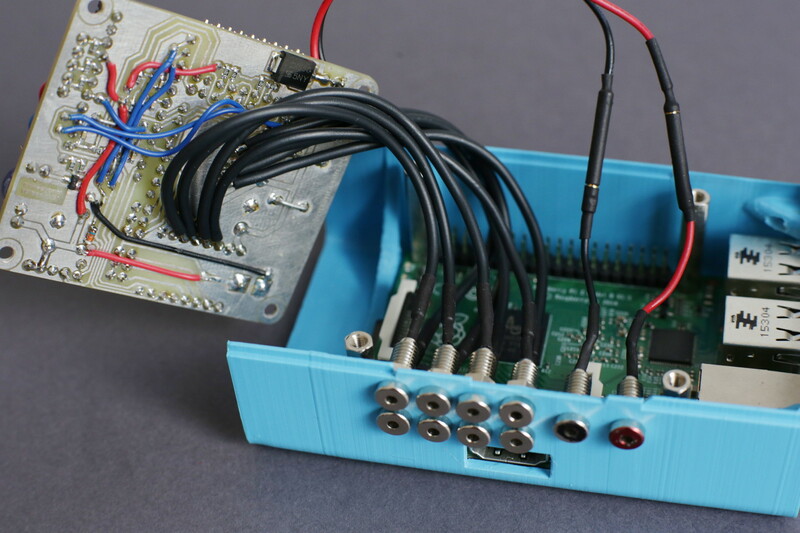 If you want to use a Raspberry Pi to run print jobs from, simply connect the relevant pins on the Monkeyprint board to the 40-pin GPIO header of your Raspberry. They have the same pin-out and exactly align with the GPIO pins, so just solder some wires to the Monkeyprint board, attach a female header and plug it onto the Pi. 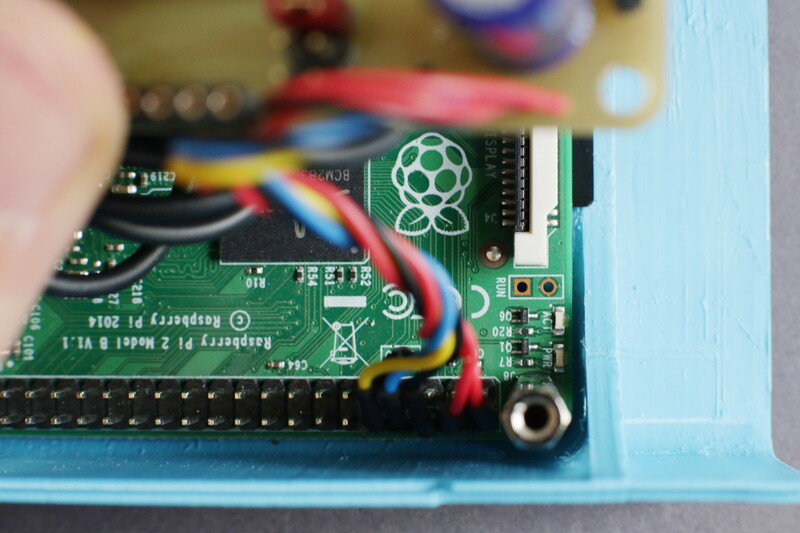 … and plug it onto the GPIO header of your Raspberry Pi 2 in the same orientation as the pins are on the Monkeyprint board. 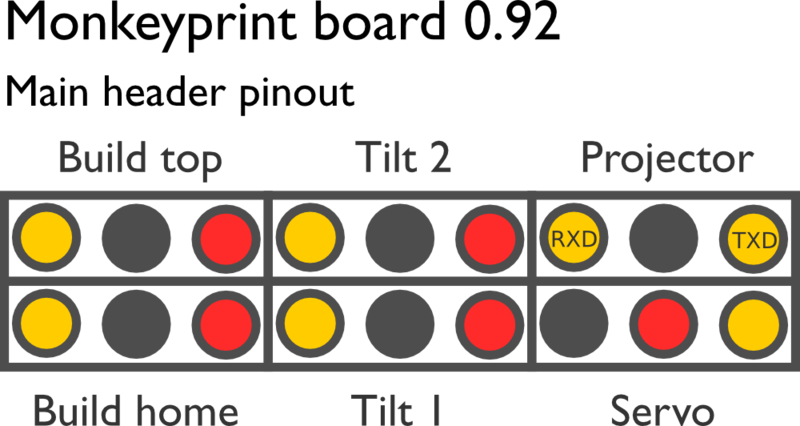 The end switches are connected by 3 lines: ground, 5 V and the signal line. I use Everlight ITR8102 photo interrupters as end switches. Whichever your use, check your data sheet to identify the anode and cathode of the IR diode as well as the emitter and collector of the photo transistor. To wire the photo interrupters, first connect the cathode of the IR-diode to the emitter of the photo transistor by simply bending its wire until it’s connected to the emitter wire. Then, solder your ground line to one of these pins. 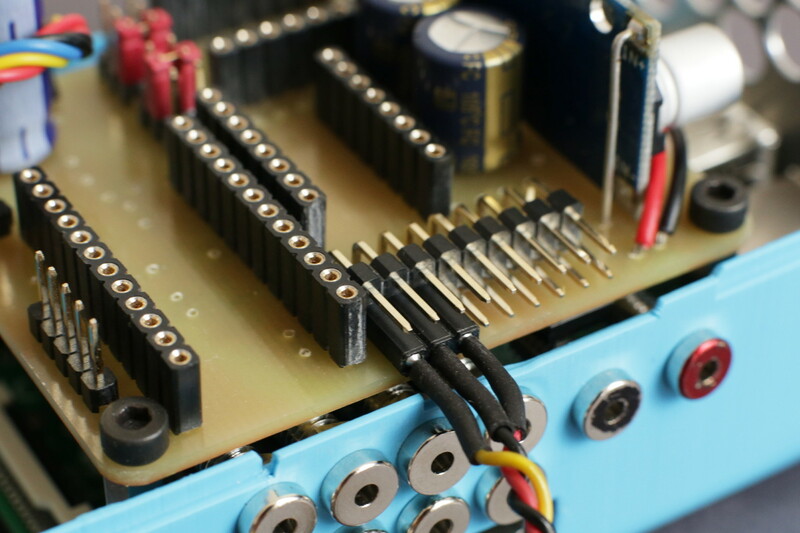 Now, solder the signal line to the photo transistors collector and the 5 V line to the IR diodes anode. Connect the IR diode’s cathode and the photo transistor’s emitter, then solder the black ground line to it. 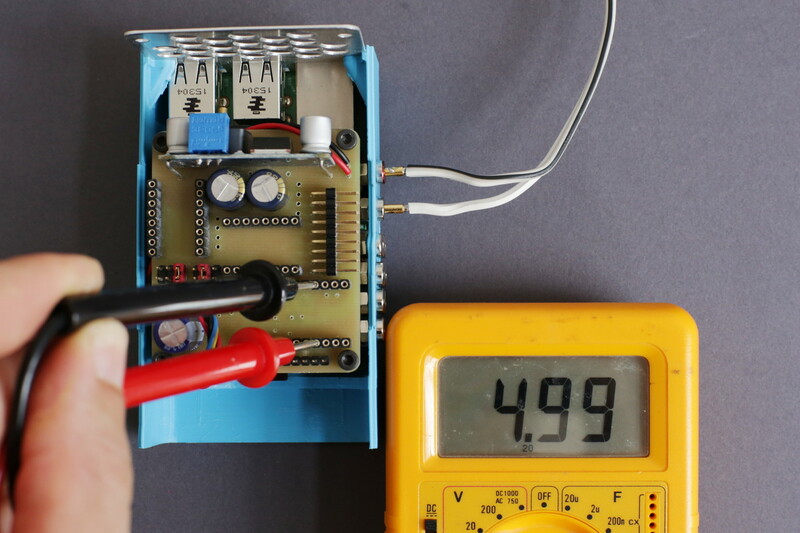 The red 5 V line goes to the diode’s anode and the yellow signal line goes to the transistor’s collector. The end switch with its cable and connector attached. You can now plug your end switches to the header on the Monkeyprint board according to the following image. The end switches are plugged into the angled header on the Monkeyprint board. The next picture shows which end switch goes where. Pin-out of the Monkeyprint DLP printer control board main header. 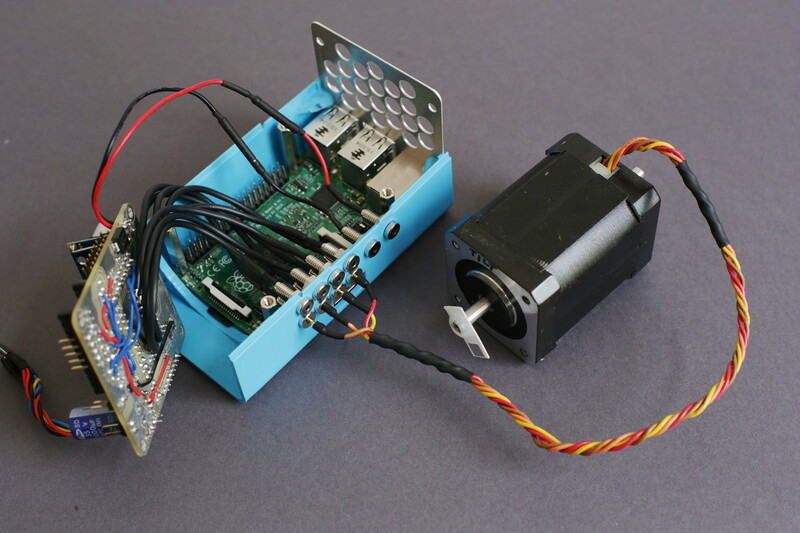 There is now support for a shutter servo. 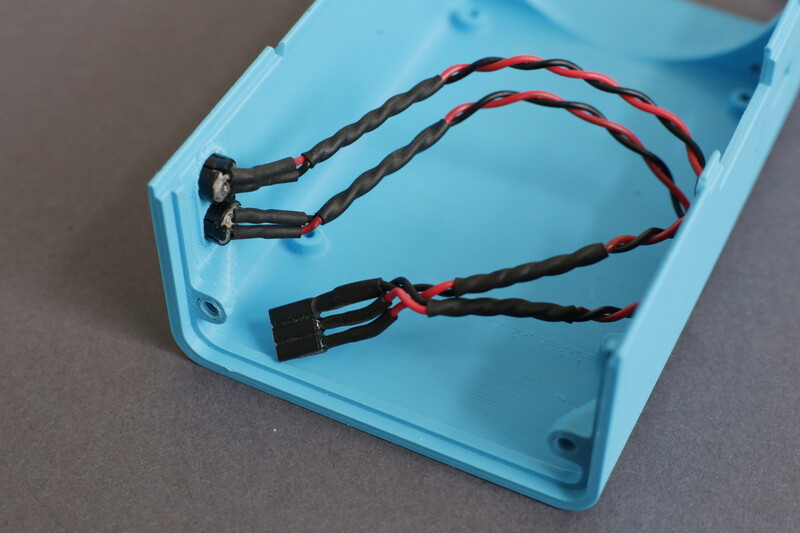 Before you plug it onto the header on the Monkeyprint board, make sure the pins in the servo’s connector are in the right order. In the board version 0.91 ground has to be in the center which might require you to reorder your servo connector’s pins. In board version 0.92 the 5 V line is in the center, which is far more common for servo connectors. I’m still using the board version 0.91 so I had to flip the servo’s red 5 V line with the brown ground line. 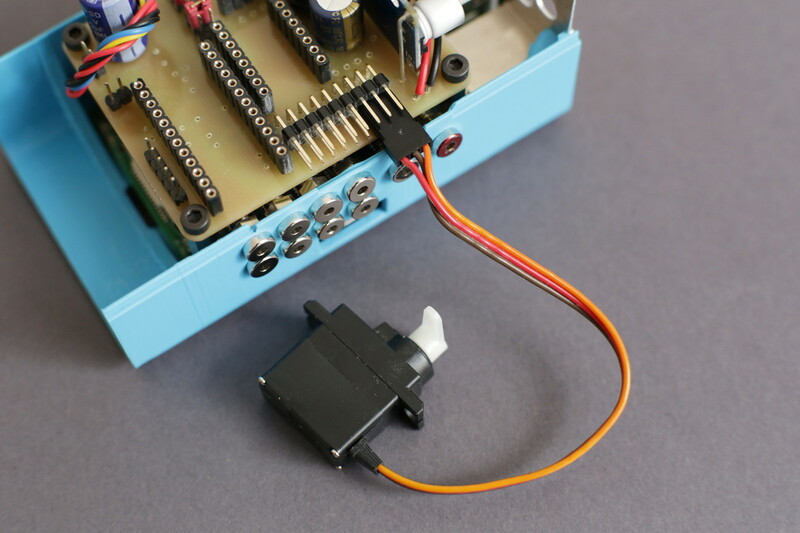 The shutter servo attached to the Monkeyprint DLP printer control board. You can plug two LEDs onto the board using the connector next to the Arduino. These will light up on stepper motion and signal the direction in which the stepper goes. Use a 3 pin female header for that. 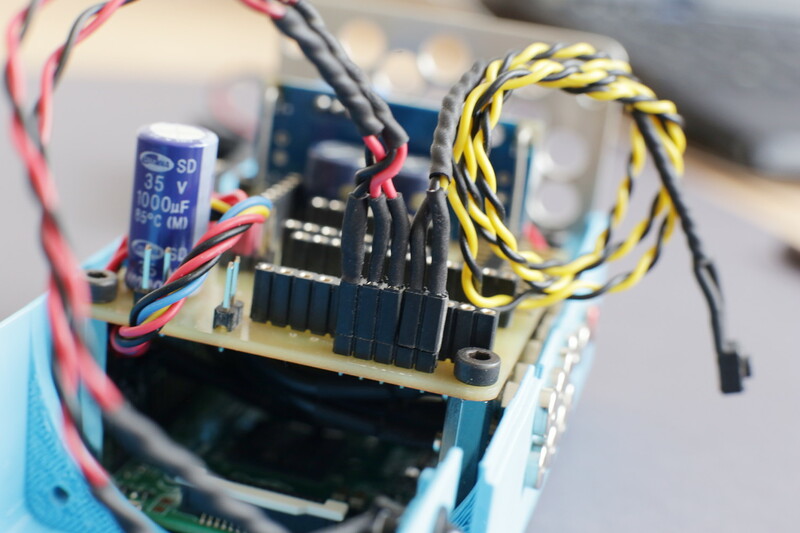 Simply connect the cathodes of two LEDs of different colors with the ground pin and the two anodes with the other two pins. I use some LED mounting rings to fix the LEDs to my electronics box. The two external LEDs share the same ground pin on their 3 pin female header. The reset button can be used to reset the Arduino. This is needed to flash the firmware or in case something hangs and you want to stop the motors and restart. 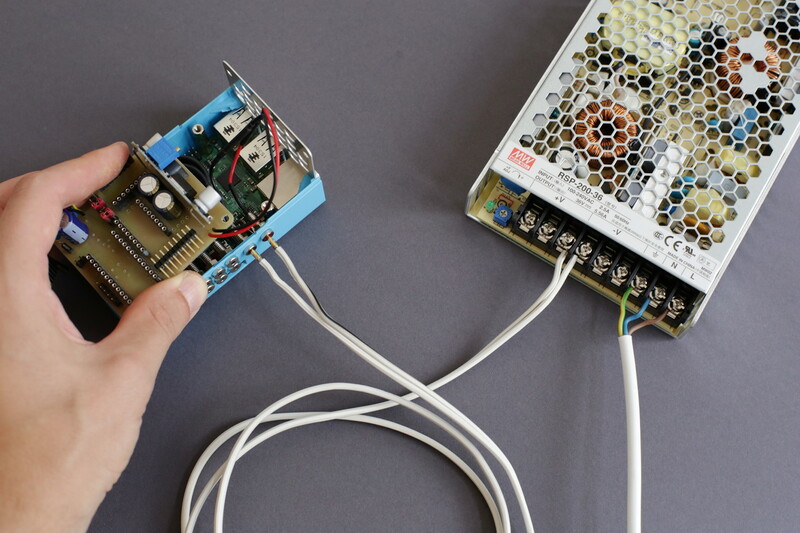 Simply connect a button to two wires and plug them onto the board using a female header. 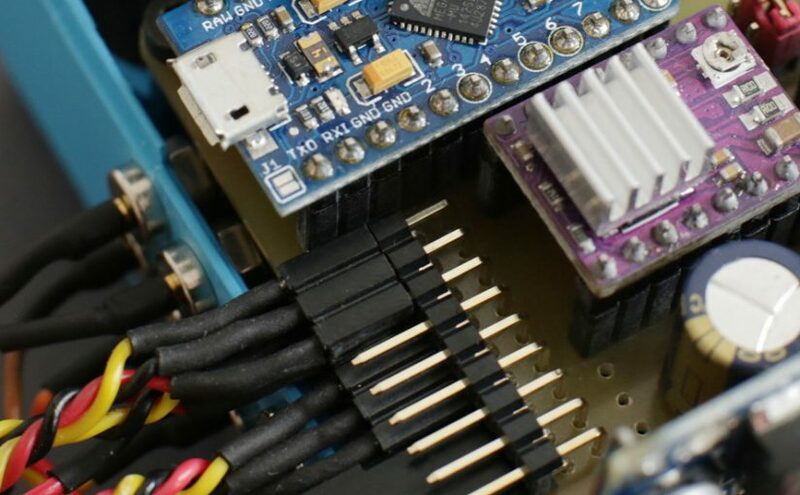 Simply plug the LEDs and reset button onto the 5 pin connector next to the Arduino, just like in the picture. You should really use a cooling fan to protect your stepper drivers (and your Raspberry Pi if you use one) from over-heating. 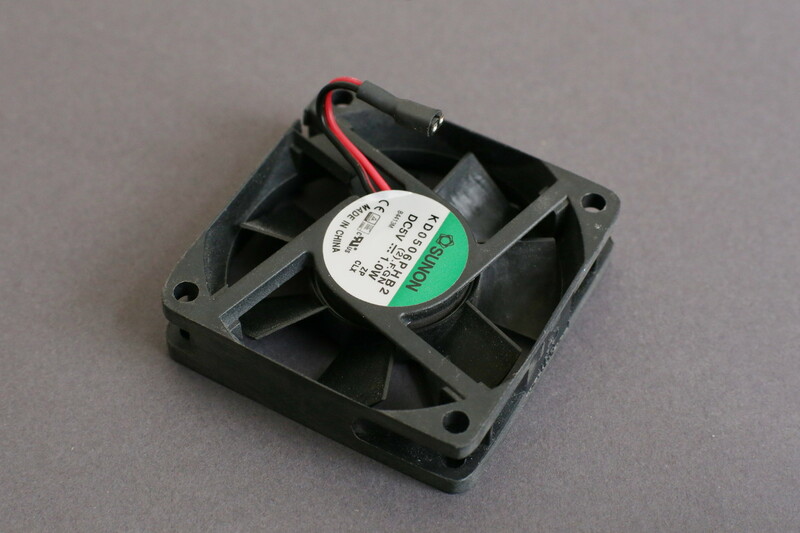 I use a 5 V 200 mA fan made by Sunon. It is a 60 mm fan which fits my electronics box quite nicely. I cut the cord to about 3 cm and removed the rpm signal line. As the fan sits directly next to the board the short cable will be of advantage. I cut off most of the cable and removed the yellow rpm signal line from my 60 mm fan. The Monkeyprint board with two steppers including end switches, a shutter servo, status LEDs and reset button attached. Not visible: Raspberry Pi 2 beneath the Monkeyprint board. It is now time to plug in the stepper drivers and the Arduino! First, the stepper drivers. Plug them in just like in the picture below. Plug in the two stepper driver just like in the picture. 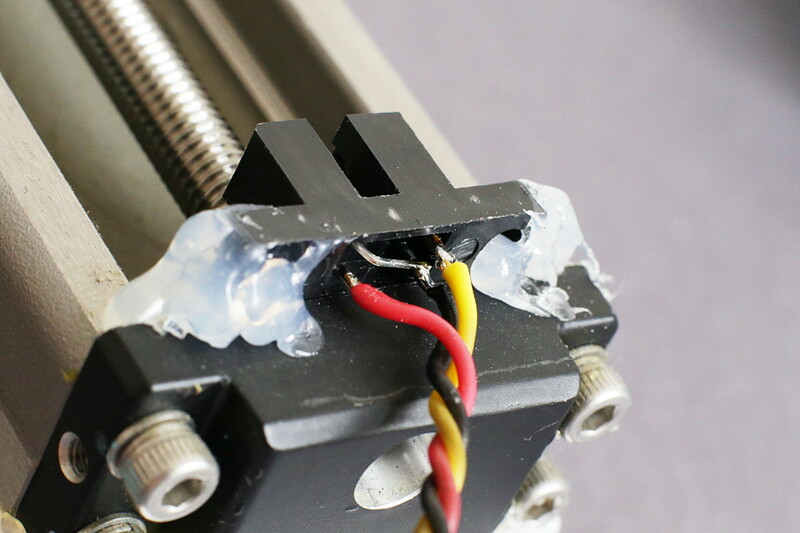 Before you proceed, make sure that the current limiting of the drivers is set according to your stepper motors’ specs. 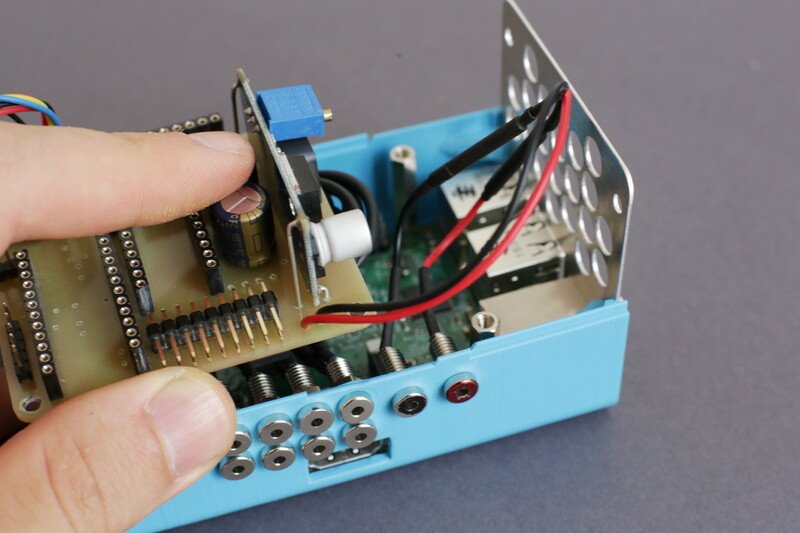 This is done by turning the small potentiometers. Please refer to the instructions given by Pololu on setting the current right. Do not plug in the steppers before you have set the current! 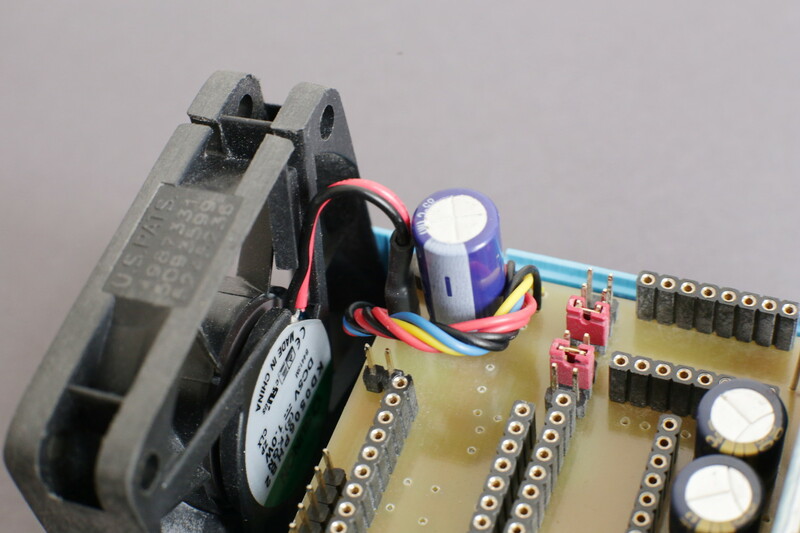 Also, do not plug in or remove the stepper motors while the board is powered! Next, plug in the Arduino with the USB connector pointing outwards. 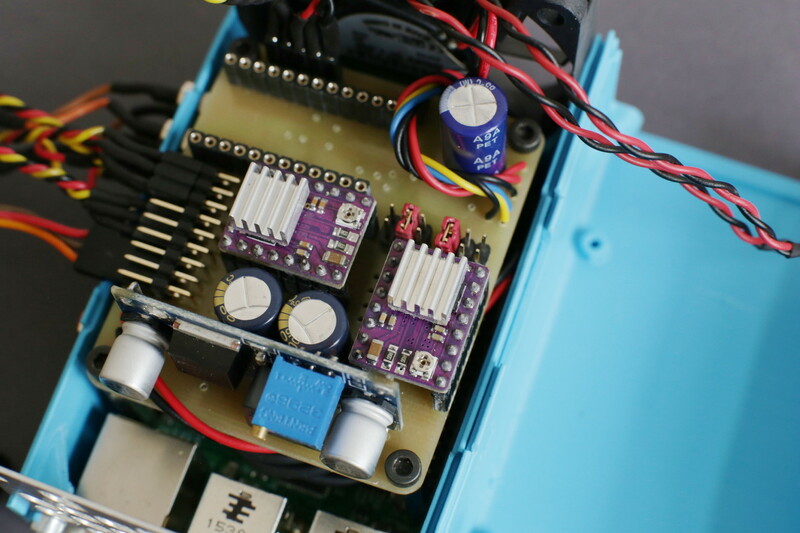 Attaching the Arduino Pro Micro is the last step and completes your Monkeyprint DLP printer control board. To blow some life into the Monkeyprint DLP printer control board you need to flash the firmware into its memory. To do this, connect the Arduino to your PC using a micro USB cable. Start Monkeyprint and select “Flash firmware” from the “Settings” menu. Then, press the reset button twice within 750 milliseconds. 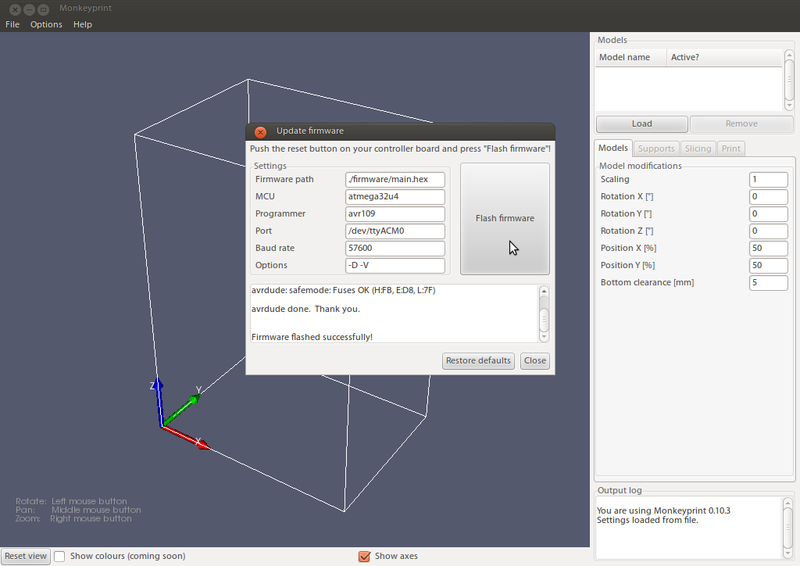 After that, the Arduino starts its bootloader and will accept the firmware update. Simply hit “Flash firmware” and wait until you see the output in the text view below (it should say something with the word “success” in it, otherwise it went wrong). Flash the firmware via the Monkeyprint firmware dialog. Hit your Arduino’s reset button twice within 750 ms, then click the “Flash firmware” button and wait for the success message. Please tell me how you like it in the comments below. Also, if you run into trouble don’t hesitate the post that in the comments as well! Thank you for your great project! I was trying to compile your python based Monkeyprint in my Windows 10 baesd pc, but it failed for some reason. 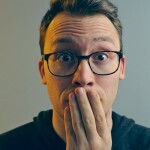 Can you compile your source code for Windows computers? Thanks!